Enter for your chance to Win one of 5 x Agatha Raisin Series 2 DVDs. 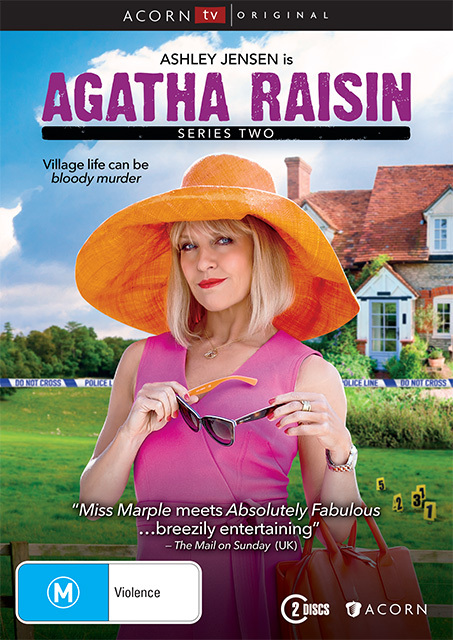 Ashley Jensen reprises her role of city PR turned country sleuth in six new episodes of Agatha Raisin. Adapted from the bestselling books by MC Beaton, the first series was an instant hit on Sky One creating a strong fan base around the world. Ep1, Ep2 – The Wizard of Evesham – the hairdressing wizard Jonny Shawpart works magic on more than just Agatha's hair. But he hears many secrets in the hairdresser's chair and it seems one of them might lead to his murder. Eps, Ep4 – The Fairies of Fryfam – Agatha finds herself holed up in the strange village of Fryfam where a number of myserious occurrences are said to have been carried out by fairies. Ep5, Ep6 – Curious Curate – Agatha is swept off her feet by Carsely's new curate – along with every other female in the village, but who could be responsible for the carnage that ensues..
* Q1: Name John Travolta's new movie?